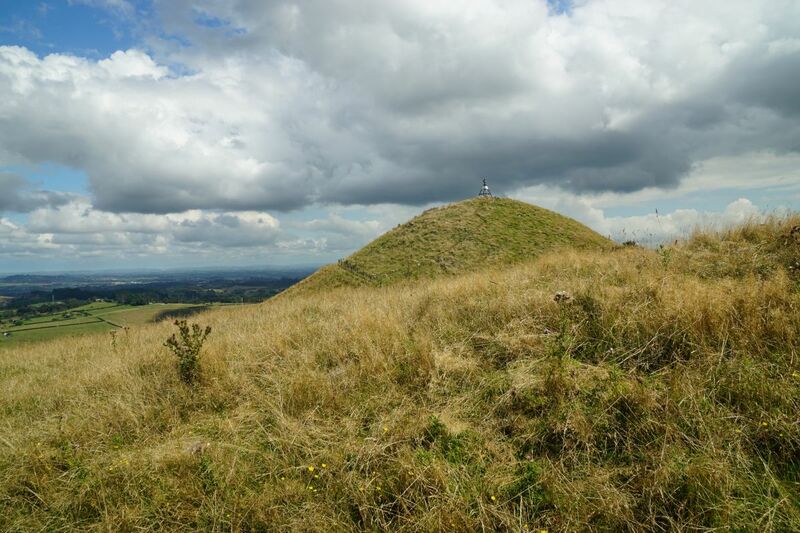 The Mount William Walkway is located on the southern flanks of the Bombay Hills, at the northern edge of the Waikato district. 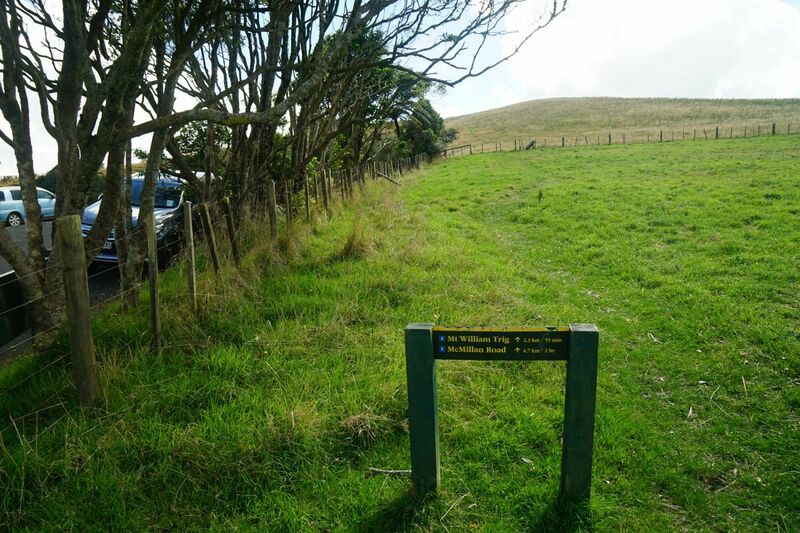 The walkway connects Puketutu Rd south of Bombay, and McMillan Rd, Mangatawhiri, with most of the walk being through open farmland. 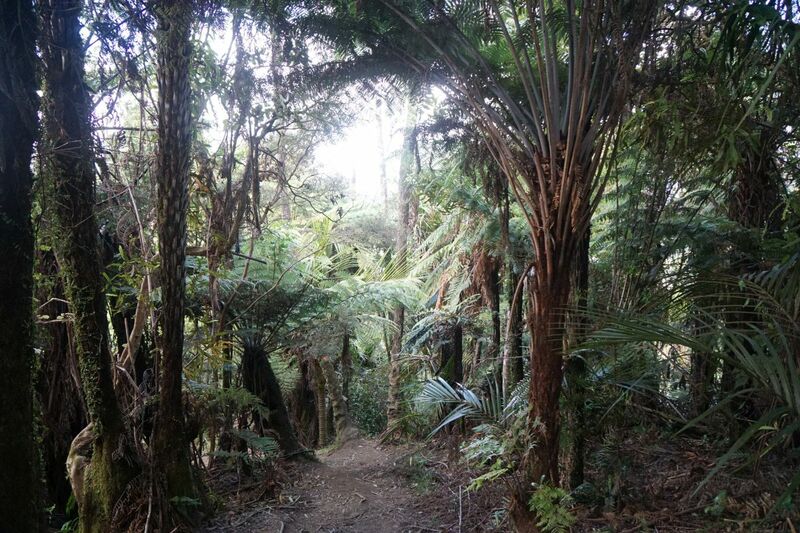 A short, but fairly steep, part of the track passes through regenerating native bush in the Mount William Scenic Reserve, between McMillan Rd and Mt William trig station. 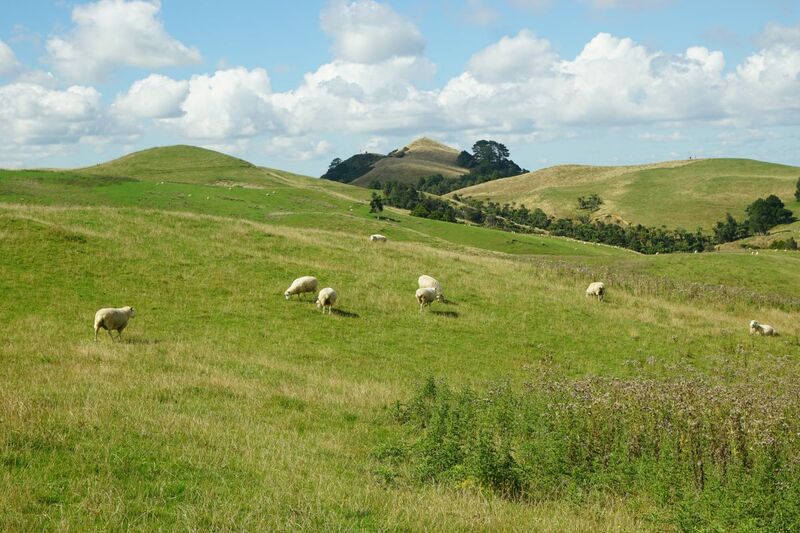 Since the walkway passes through sheep farms it may be closed during the lambing season between August 1 and October 1, and dogs are not permitted at any time. 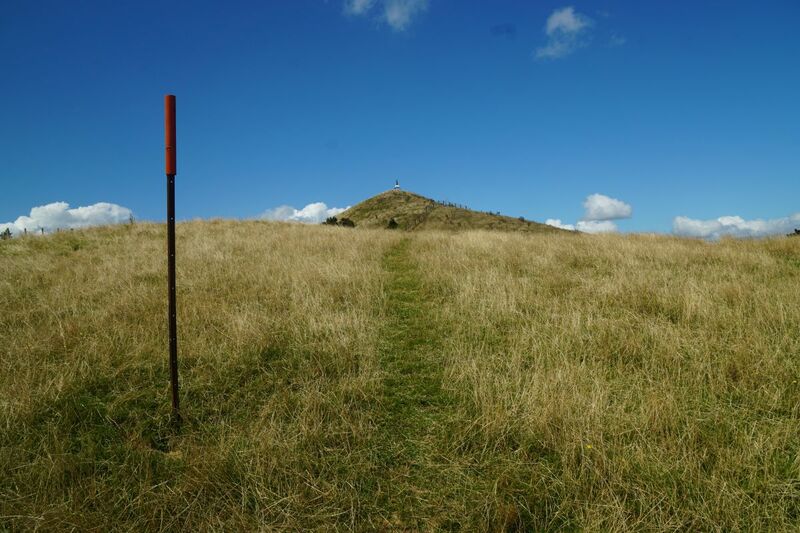 The walkway also gives access to Puketutu trig, on a peak which at 376 metres is slightly higher than Mt William at 373 metres. 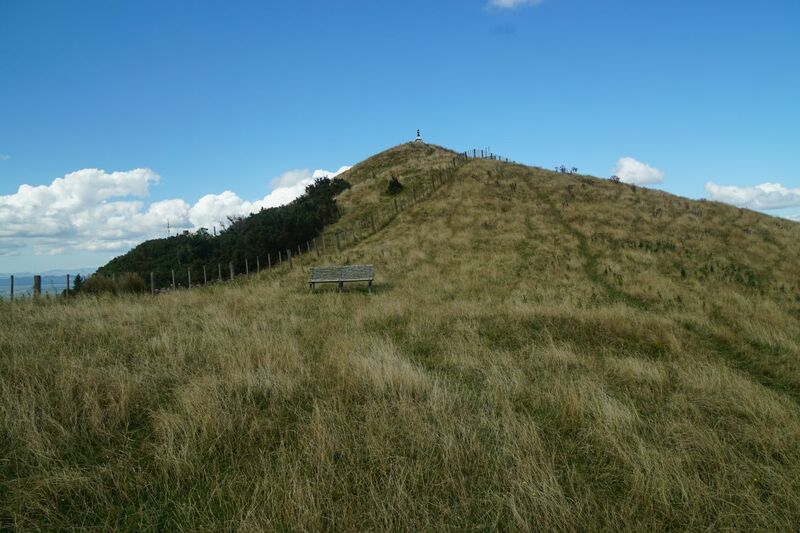 Puketutu peak is a few metres higher, at 379 metres. 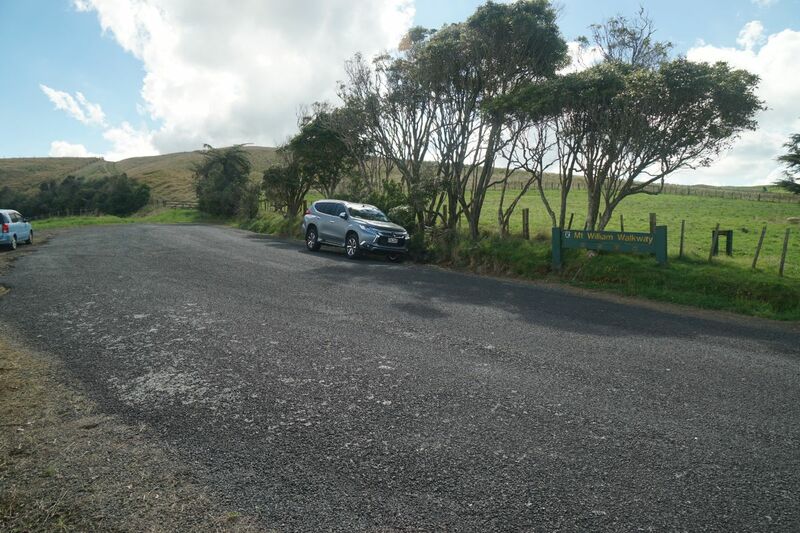 There are car parking areas both at the end of Puketutu Rd and the end of McMillan Rd, and toilets about 10 minutes walk from McMillan Rd where the track enters the Mount William Scenic Reserve. Information about the walkway can be found on the DoC web site. 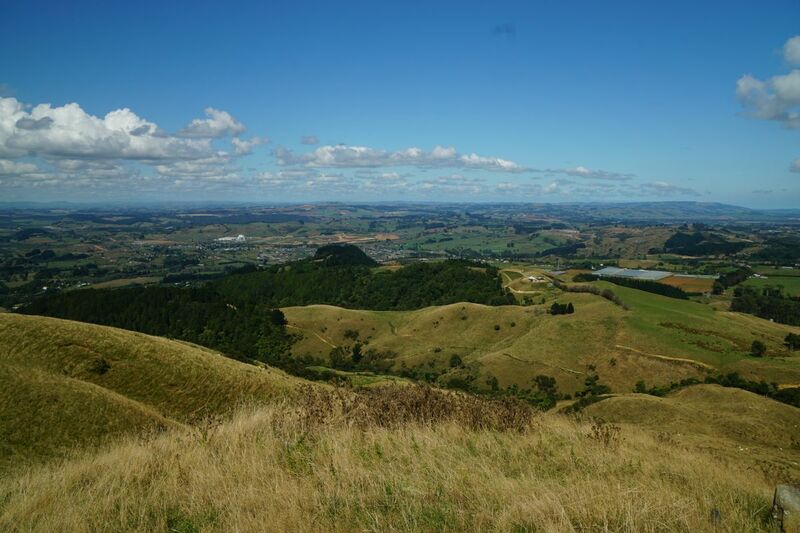 There are extensive views of the Waikato, Franklin, and part of the Auckland area from Mount William trig station. From Puketutu there are wider views of the Auckland area. The walk was done from Puketutu Rd to Puketutu trig, to Mt William trig, and on to McMillan Rd, returning the same way but bypassing the Puketutu trig branch. Total distance was 10.7 km with a total time of 4 hours, two hours each way, including a 10 minute lunch break on the return. The elevation of the Puketutu Rd carpark is about 270 metres above sea level, and the McMillan Rd carpark is at about 75 metres. 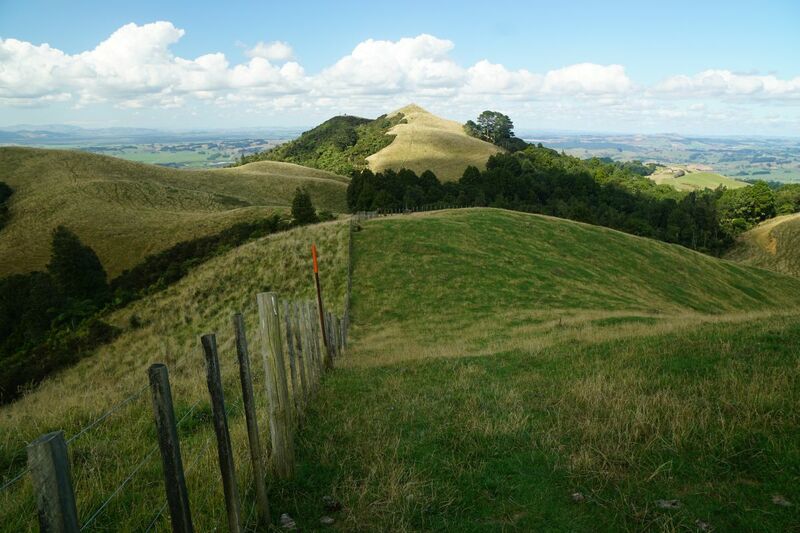 Since the farmland is undulating the total height climbed was about 650 metres. 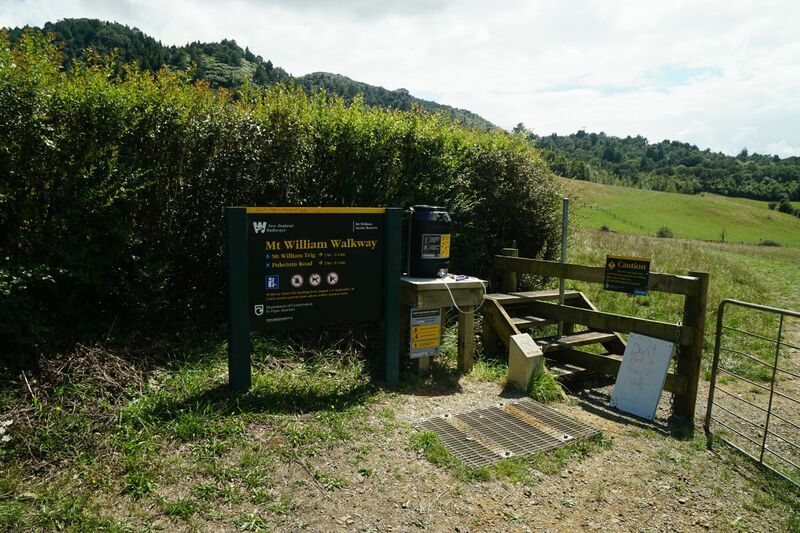 The carpark area and starting point of the Mt William Walkway at the end of Puketutu Rd, off Razorback Rd, which is accessible from SH1 at the Ridge Rd/Nikau Rd on-off ramps. 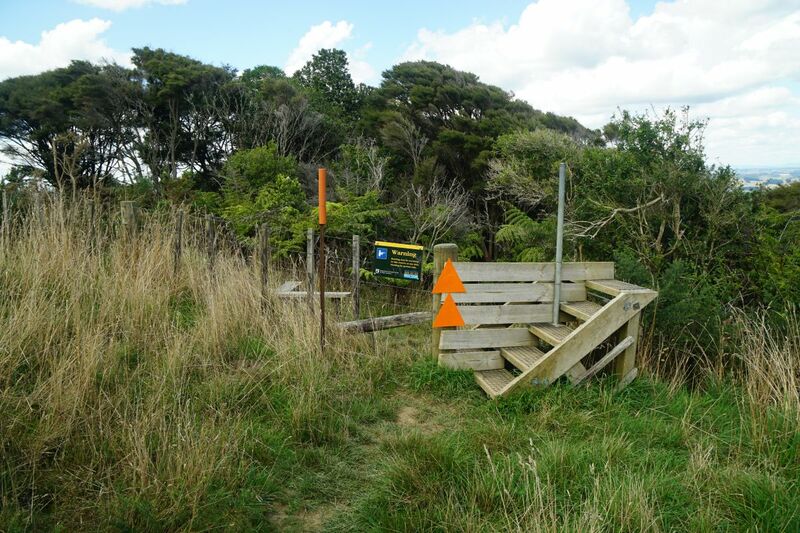 The start of the walkway at Puketutu Rd, with the carpark on the left, and the next stile to be crossed in the fenceline above the sign. The sign shows 55 minutes to Mt William trig, and 2 hours to McMillan Rd. The walkway through farmland is indicated with orange pipe on the top of post, mainly steel y-posts, but in this case a wooden batten. 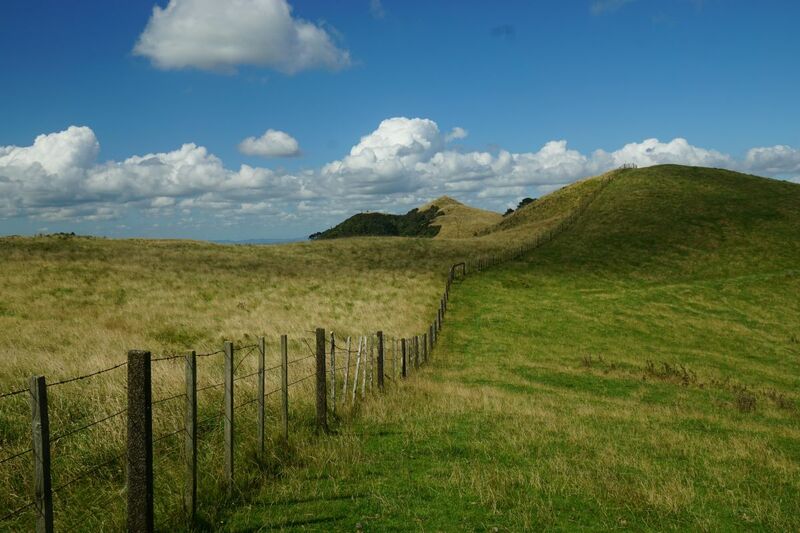 Here looking back towards Puketutu Rd, with Pukekohe Hill visible between the marker and the stile handhold. Mount William trig, the highest point on the horizon at picture centre, is visible along the way from Puketutu Rd. 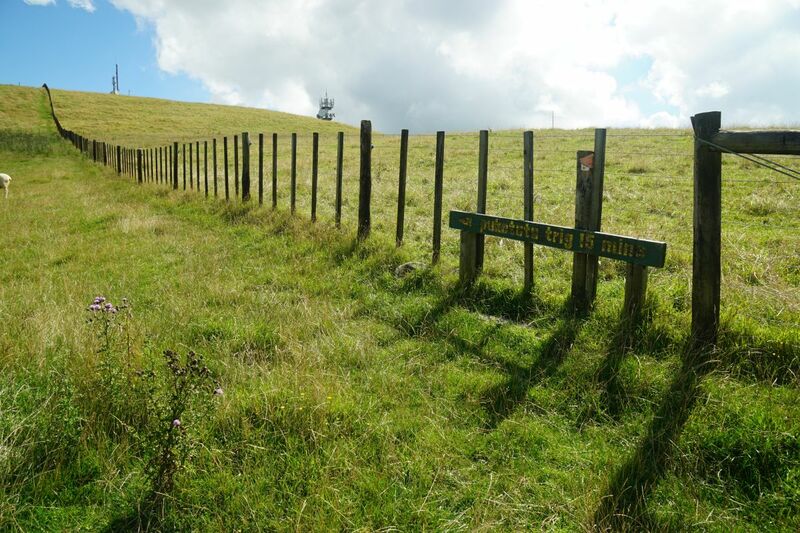 The track to Puketutu trig branches off the Mt William Walkway, following a fenceline to summit where there are several communication towers and masts. The largest of the communication towers, with the trig station just visible on the horizon to the right of the tower. The track to Puketutu trig passes alongside a valley with regenerating native bush. Mt William trig can be seen on the highest peak on the far right. 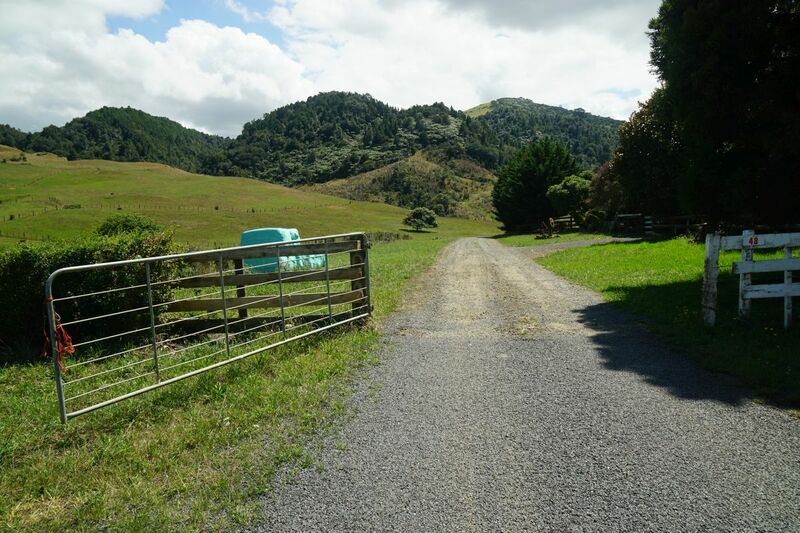 The Kaimai Range is in the distance to the left. 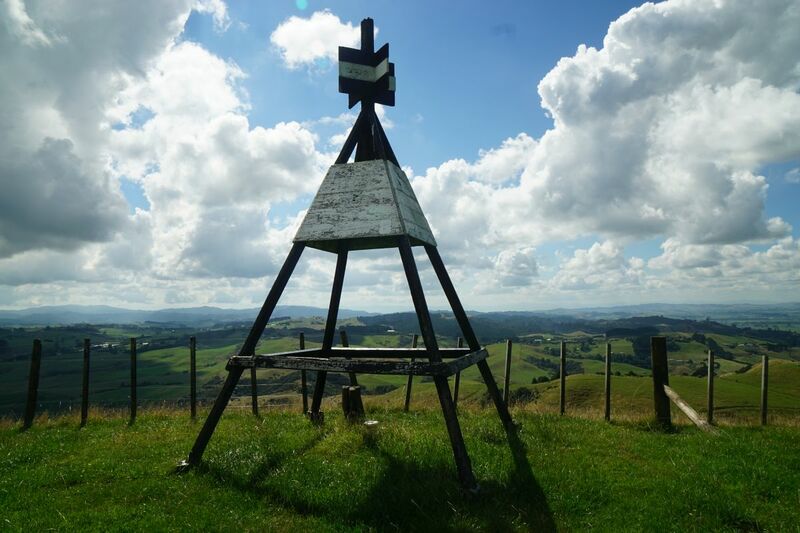 The Puketutu trig, with views towards the east. 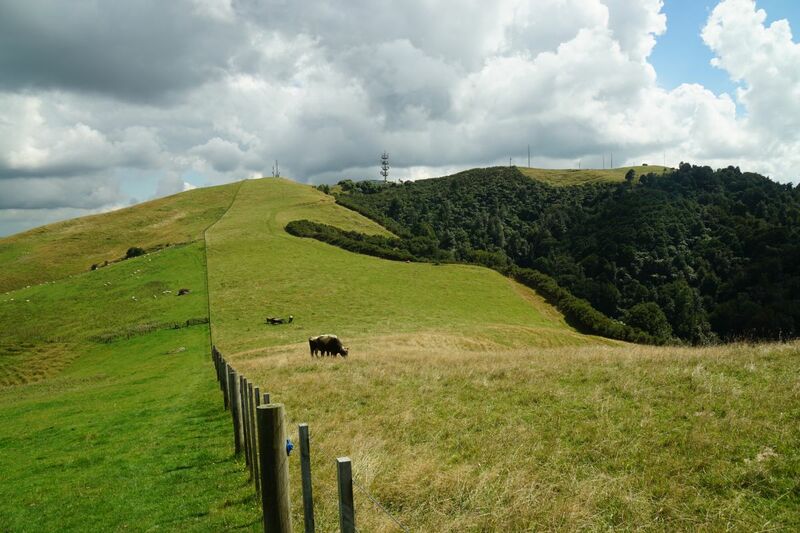 The Hunua Ranges can be seen to the left. Looking back at Puketutu from the Mt William Walkway, which mostly follows a fenceline. And in the other direction Mt William trig is visible on the peak at picture centre. There are still a few climbs and descents before reaching the summit. 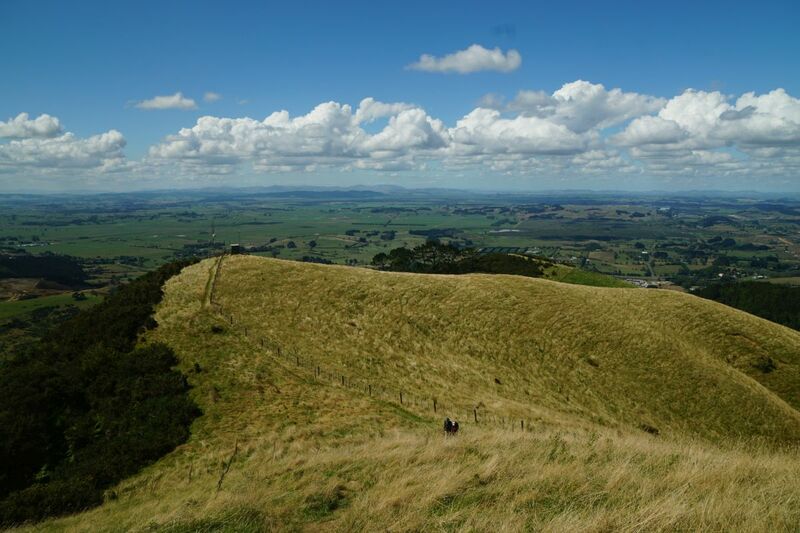 A vista of the north and central Waikato district now opens up behind the Mt William peak. One of the steel y-post track markers where the walkway does not follow the fenceline. 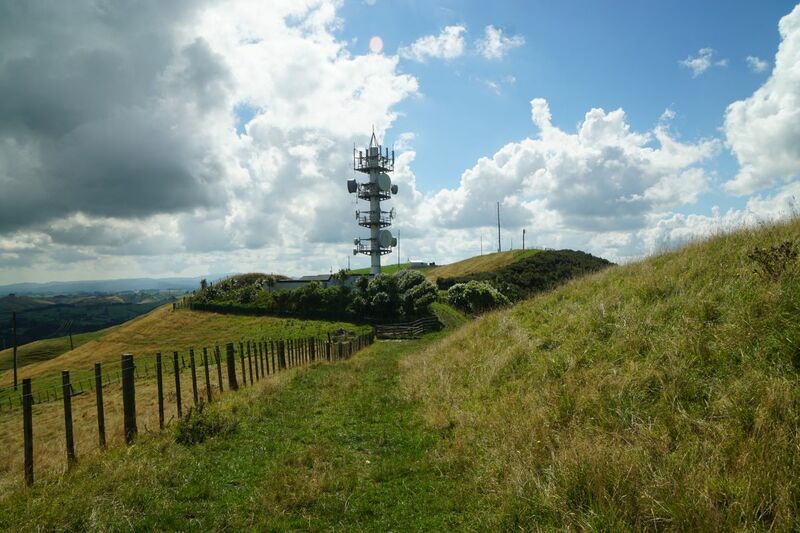 The trig station is clearly visible on the peak. An old bench seat, covered in mosses, is provided for those needing a rest before the final climb to the summit of Mt William. 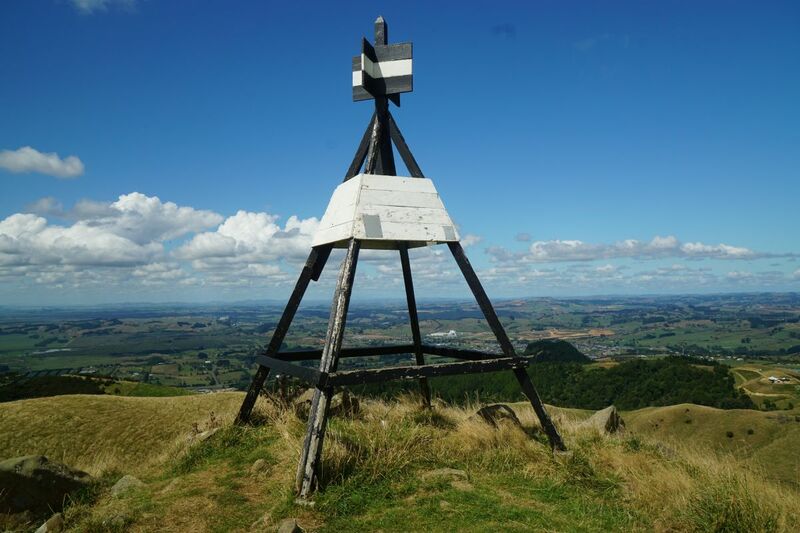 Mount William trig station, with views of the Waikato. Pokeno can be seen between the legs of the trig station, and just to the right of it. 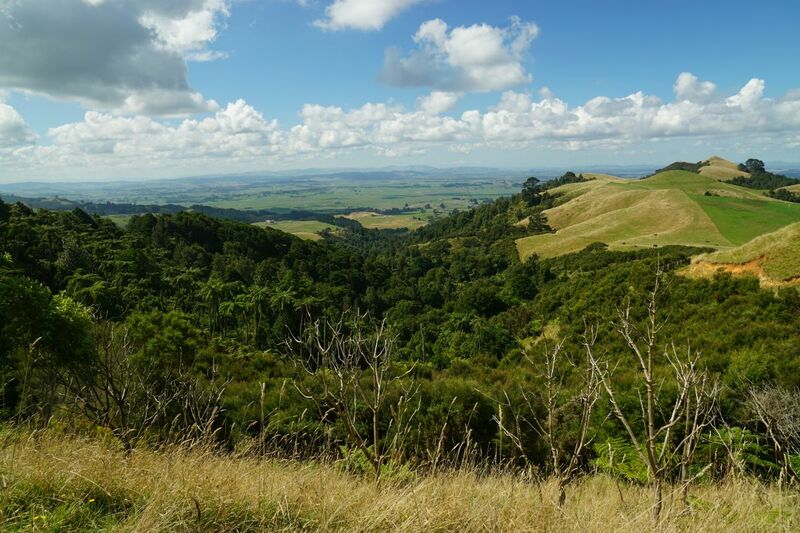 View towards the Kaimai Range from the trig station. The track continuing on to McMillan Rd follows the fenceline. 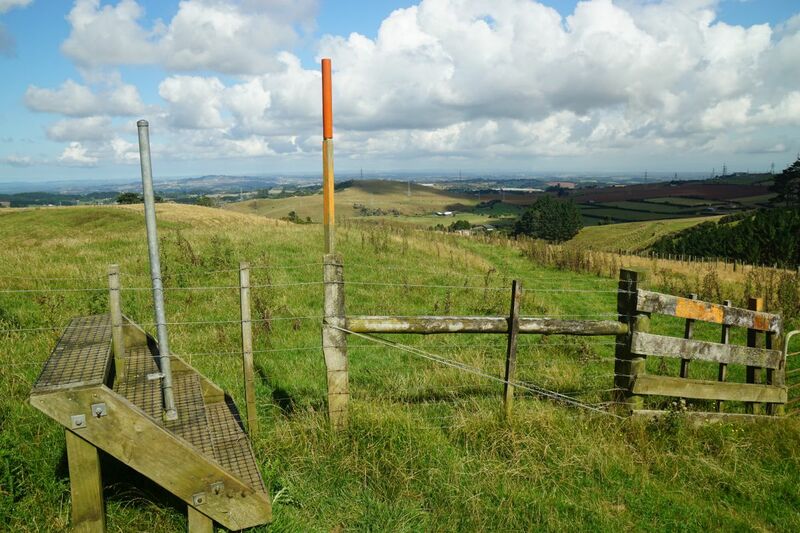 View from the trig station across Pokeno to the Waikato. 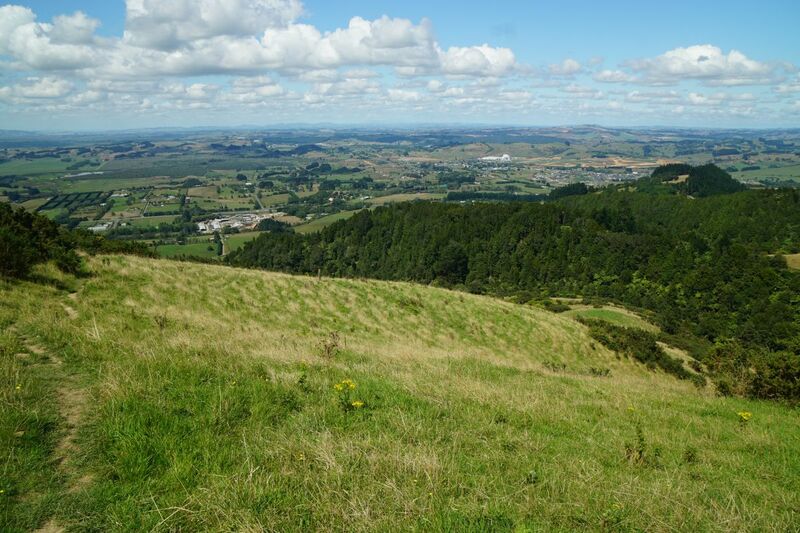 View from the trig towards Manukau Harbour and the western part of Auckland. Unfortunately visibility in that direction was not very good. Puketutu can be seen to the right. Mt William trig seen from the walkway heading down towards McMillan Rd. From the walkway heading towards McMillan Rd. McMillan Rd, with a shelter belt of trees alongside it, is visible just below the timber mill to the left of centre. 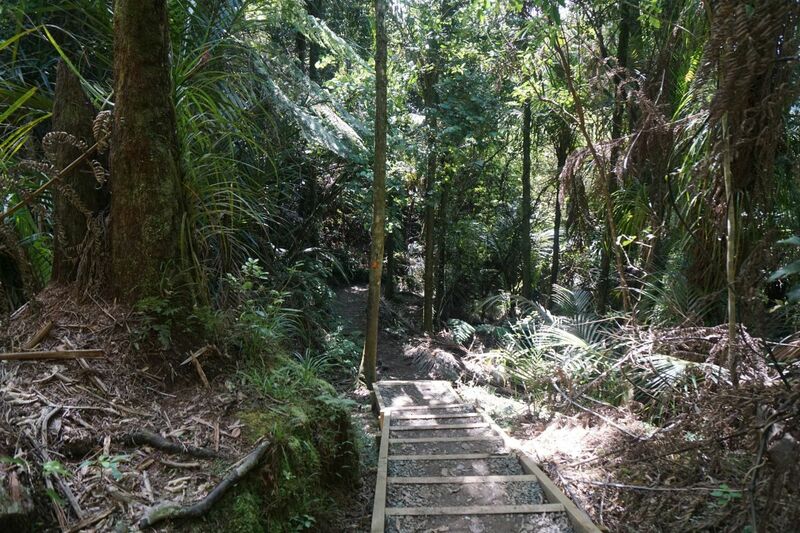 The walkway heading towards McMillan Rd as it enters the Mount William Scenic Reserve. The reserve contains mostly regenerating native vegetation. The track is quite steep in places, and is slippery when wet. Steps have been built on some of the steeper sections of the track. 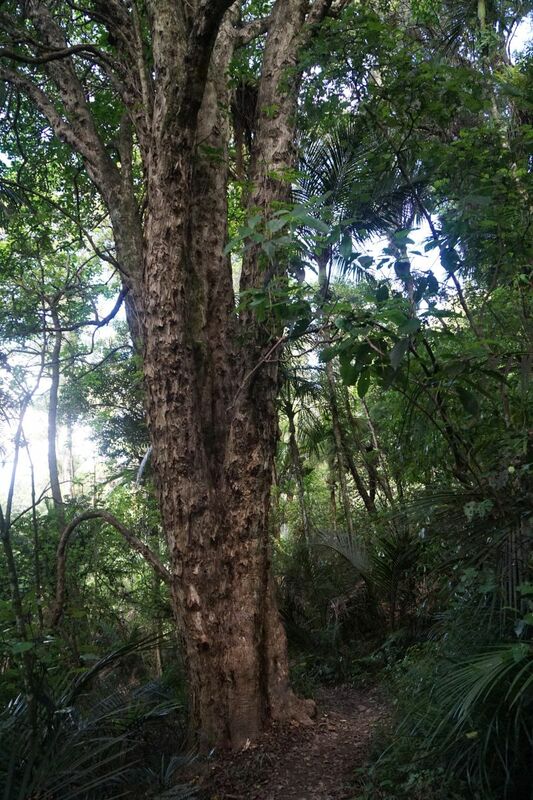 There are some older and larger trees alongside the track, such as this multi-trunked puriri. The entry point to the lower end of Mount William Scenic Reserve, and the Mt William Walkway. 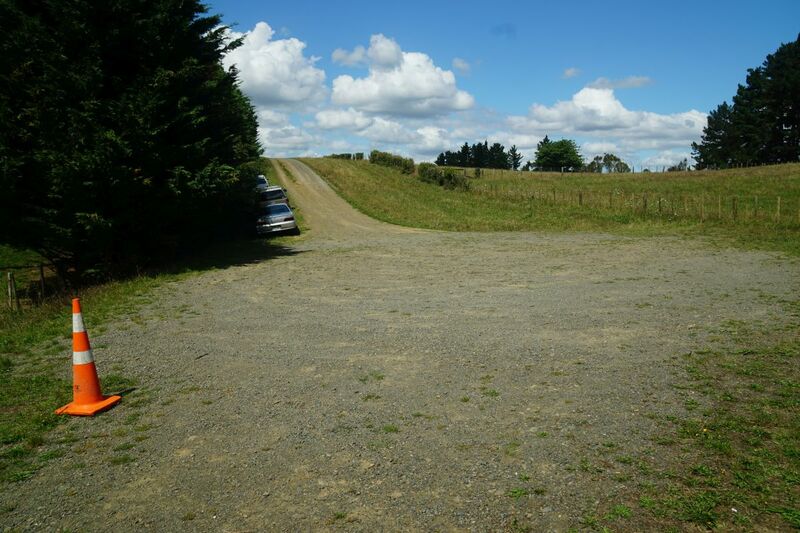 The entry point seen from the farmland track between the reserve and McMillan Rd. Toilets can be seen behind the stile, on the left. 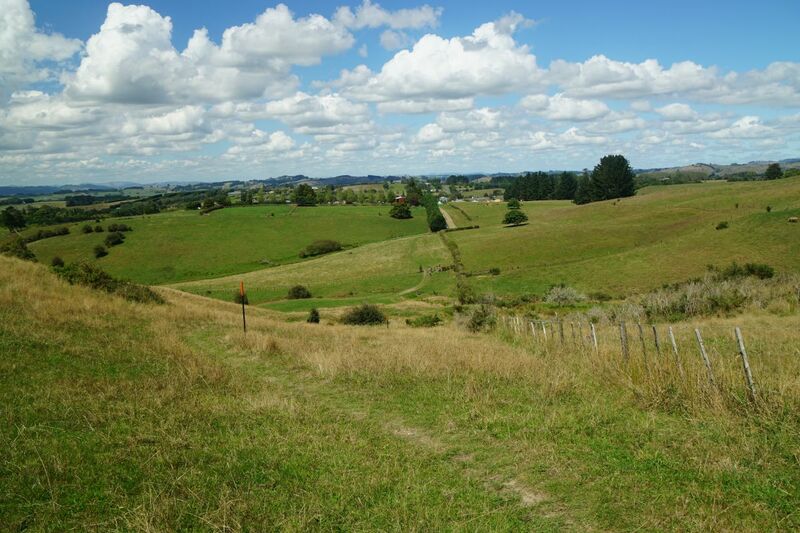 The walk from the reserve to McMillan Rd crosses over farmland. The shelter belt and road can be seen just to the right of centre. The start of Mt William Walkway at the McMillan Rd carpark. 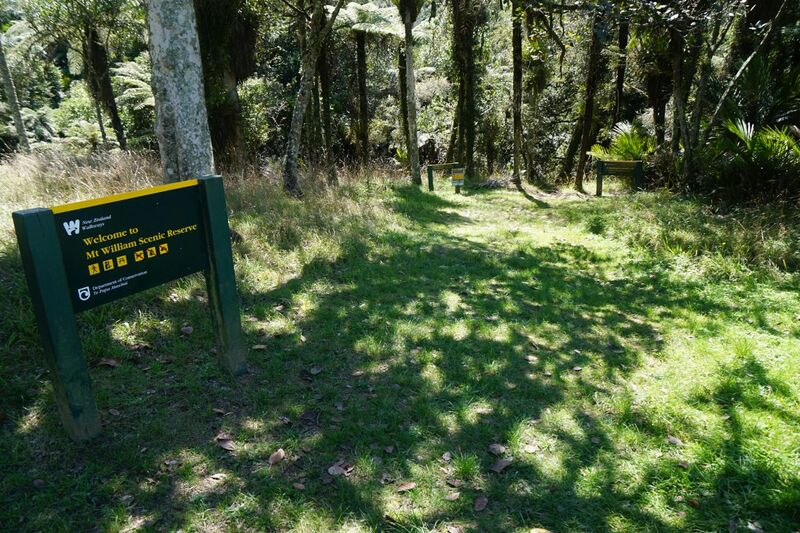 There are facilities for cleaning and disinfecting footwear to prevent the spread of kauri dieback disease, although the old track to a small grove of kauri has been permanently closed. 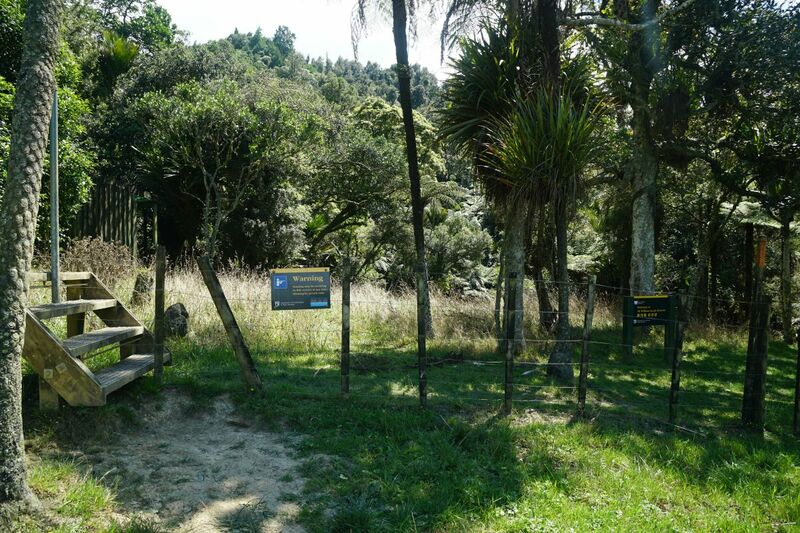 No kauri trees were seen on the walk through the reserve. McMillan Rd carpark is down the gravel continuation of McMillan Rd, through the gate. Mt William trig is hidden behind the peak on the right. McMillan Rd connects to Irish Rd, which branches off SH2 between Pokeno and Mangatawhiri. 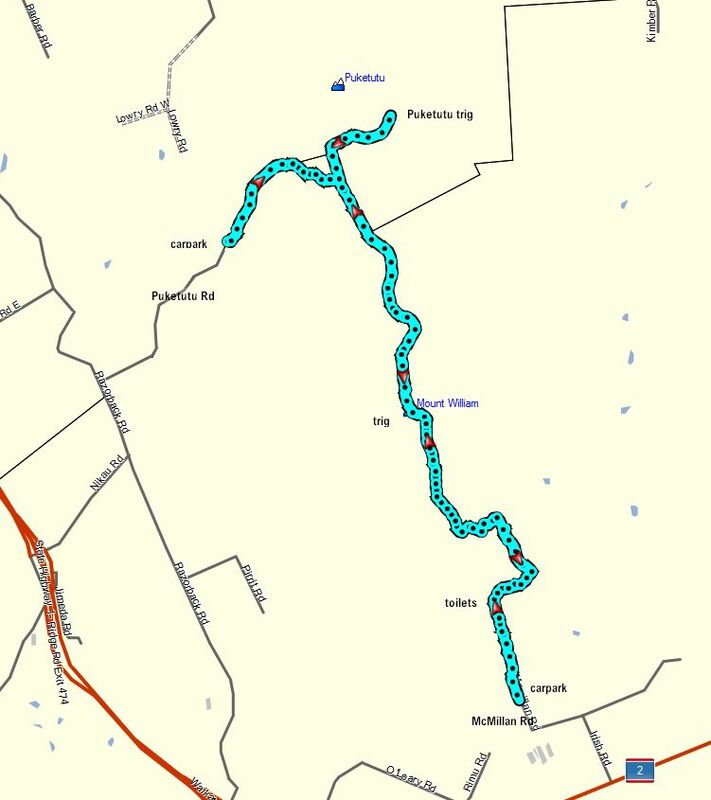 The GPS tracklog shows the route taken, starting from the carpark on Puketutu Rd, taking the side branch to Puketutu trig, then continuing on past Mt William trig through the Mount William Scenic Reserve to McMillan Rd, before returning the same way but bypassing the side track to Puketutu trig. Total distance walked was 10.7 km, for a total time of 4 hours. Two hours each way, but including a 10-minute lunch break on the return walk. The side track to Puketutu trig was 1.3 km and took 20 minutes in total. Without taking the side track to Puketutu trig, the walk from Puketutu Rd to Mt William trig would have been 2.3 km, and taken 40 minutes. From Mt William trig to McMillan Rd was 2.4 km long, and took 50 minutes for the downhill walk, and 1 hour 5 minutes (excluding the lunch break) for the uphill walk. Total climb and descent was about 650 metres. 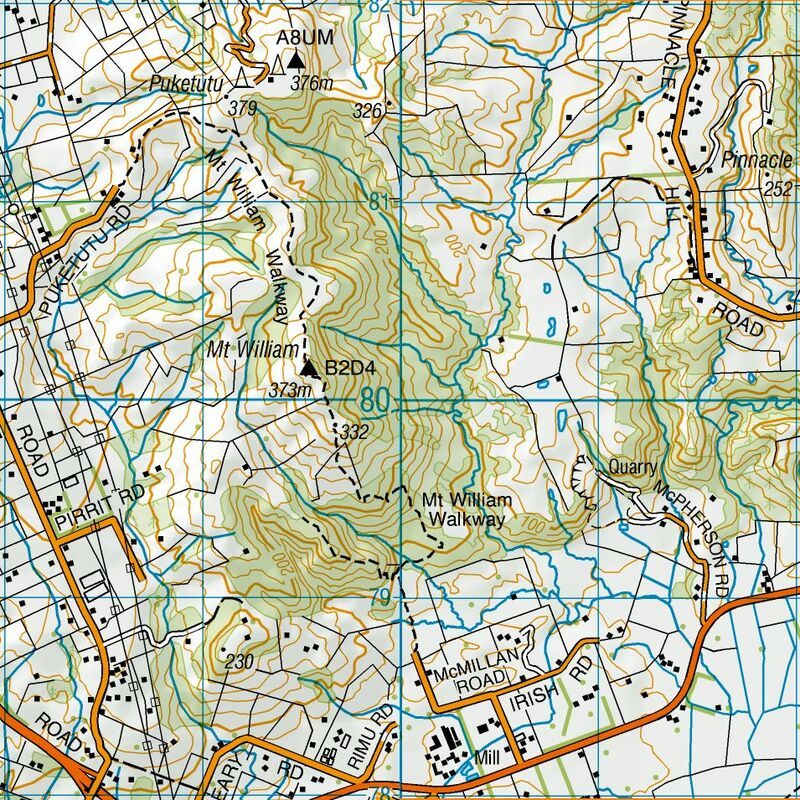 The topographic map excerpt shows the walkway, except for the side track to the Puketutu trig. 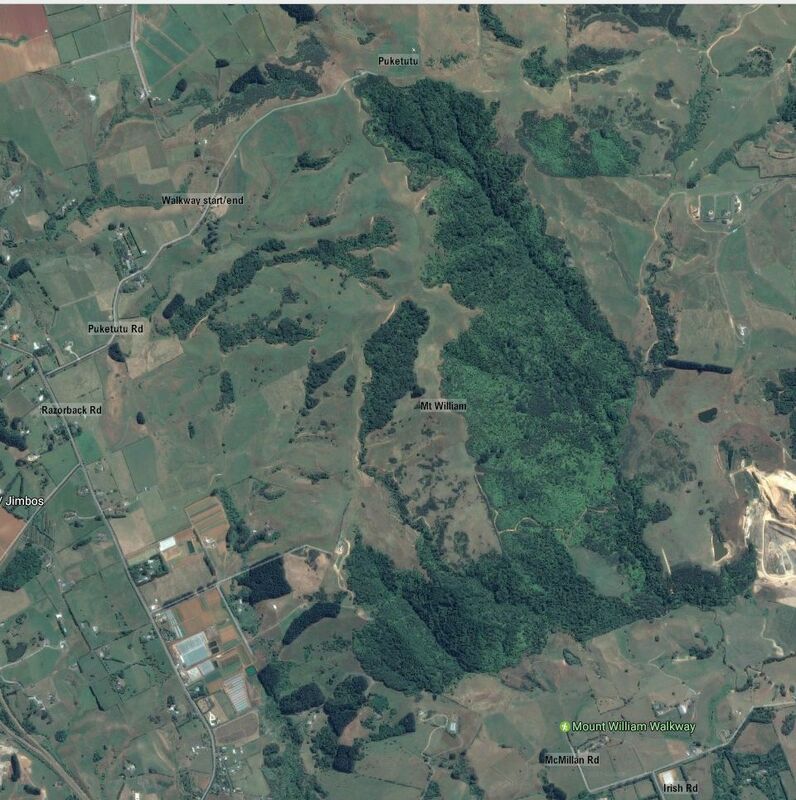 The closed kauri track at the southern end of the reserve is also shown. The walkway is not visible on the aerial photo, taken from Google Maps. There is no marker for Puketutu or Mt William, and Puketutu Rd is shown as continuing on to the summit of Puketutu. Mount William Walkway was walked on February 25, 2017. 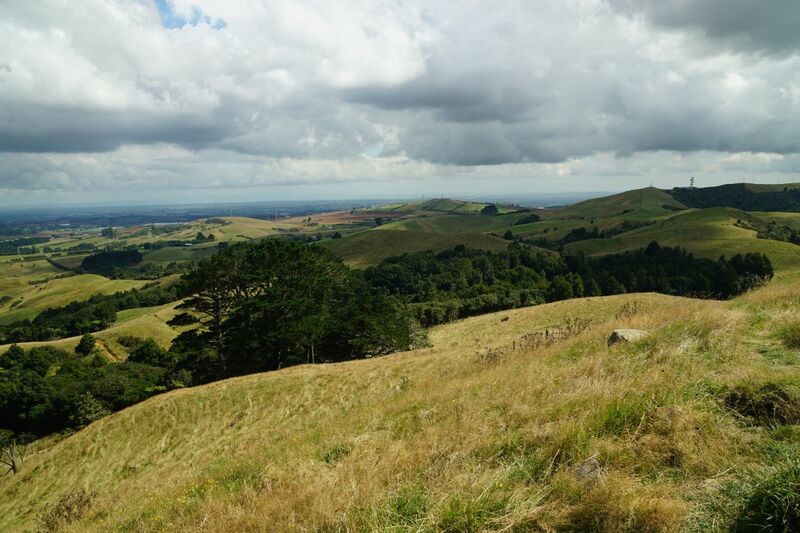 This entry was posted in Walks and tagged Auckland, Bombay Hills, Mangatawhiri, Mount William Scenic Reserve, Mt William, Pokeno, Puketutu, Waikato on 2017-02-26 by nzartig.